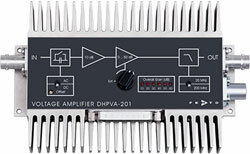 Electro Optical Components Inc.: The FEMTO DHPVA voltage amplifier series has been upgraded with the DHPVA-101 (DC - 100 MHz) and DHPVA-201 (DC - 200 MHz). Their Input voltage drift and noise are improved to an extraordinarily low level while keeping a constant bandwidth at any gain setting. DHPVA series has exceptional low input voltage drift of 0.3 µV/°C and low input noise of 2.3 nV/√Hz enable stable measurements with highest precision, even at maximum amplification. Flat frequency response without peaking is another feature. The amplifier bandwidth remains constant regardless of the gain, allowing an accurate high-speed acquisition while preserving the signal shape independently of the gain setting. The gain is variable from 10 dB to 60 dB.